Home Roaring ReviewsGift Guides	Christmas Gifts For Leo & Norah-Perfect Buys For Under 10’S & Under 1’s! My top tips for Christmas shopping for kids? Ask them to write a list but manage their expectations. My son wants an iPhone. He won’t get one until he is in double figure years. Don’t go overboard. A friend said she sticks to the buying a gift they will want, need, wear, and read and I agree having some kind of plan to buying helps. Don’t walk into a store unprepared as you will overspend. Remember they will also get presents from grandparents, uncles, neighbours etc! I always encourage parents to consider gifts (especially if family is asking for ideas) that will bring the family together i.e. Zoo passes etc. Also, don’t think your hiding place is good enough, the kids will find them! Now creating guides for children could be filled with endless lists of toys, you as parents know your children’s likes, their hobbies, the characters and tv shows they love (*cough* Pokémon!) use these as a guide but always add in one gift that introduces something new. The items I have picked are what I would choose for a seven-year-old and almost one-year old. We tend to pick one more expensive gift and then a couple of smaller gifts so are if you are expecting a feature of all the newest tech gadgets then this is not the list for you. Go with variety; a cuddly toy, a book, something electronic, something educational, something they can create with, clothing, perhaps a DVD or new game for whatever console you have. For inspiration, check out our ten toys to buy for under tens this Christmas #U10! For the child who wants a furry friend. I would choose this playful pup, AniMagic Woofles. My seven-year-old son loves soft toys. Part of me was surprised that he has been interested in them for so long when everything else has been cast off as ‘babyish’. This gorgeously soft and realistic toy boasts dog like movement and sounds after being activated with a pat to the head. It says suitable for ages three years and up and does not require any batteries as these come included (WIN! No need to hunt through the cupboard for half dead AA batteries on Christmas day!) That said, my baby daughter is in LOVE with this toy, she sits babbling at it for ages. Because of the small parts (i.e. his collar and accessories) we don’t let her handle it yet, but it is nice to see a toy that suits different ages and genders of children. I also like the fact the switch is concealed at the base under Velcro removable fur so at night you can silence his barking. An already very loved toy at our house and on sale HERE for £39.99. For the child in need of some Christmas magic. I would choose the gorgeously bound Personalised Christmas Story Collection. For me, as a parent I am always happy to buy my children books as gifts; story books, fact books, picture books. Any and all. We have a shelf in my sons’ room for special books, ones that belonged to my mother and me, some that we got given when he was born. For four years we have had an elf appear every Christmas, it has become a well-loved tradition so why not also read this personalised (five) story collection together on Christmas day? You can include a message for your child and the text is built around their name, which will also feature on the festive red hardback cover. What is more magical? Arriving ready to open in a gift box for £29.99 this present will last them through childhood and our must have gift of the season. For the child who likes to go fast! I would choose this super cool Dominator Scout complete scooter. Whether it’s a two or three wheeled, a stunt or folding scooter children love a scooter. Make the school run fly by. Designed for young riders this well-designed stunt mobile is perfect for boys and girls just starting out. It offers a smooth ride and its aluminium frame is light to pick up. Features include 100mm plastic core in-line style wheels, a fixed handlebar with soft grip to comfortably support riders, good balance and a bright design. £49.95 is a great price to get children outdoors and improve physical development, coordination and balance! Ride more, push less and buy the Dominator Scooter HERE. For the kid who has teeth. I would choose these eco-friendly dental care products for under £10. Now this gift may leave you scratching your head as aren’t presents colourful, and fun and purchasable from Argos? Santa makes sure to put Oranges and a couple of useful presents in the stocking. We have been trying to cut down on the plastics in our family and one of the most common household items that goes to landfill is the toothbrush. Woobamoo create dental products for the whole family. The handles of the toothbrushes are biodegradable, and bristles can be recycled, a child’s pack of two retails for £5.99 on sale HERE. The fluoride-free and vegan toothpastes are available in Vanilla Mint, Sweet Cinnamon, Toasted Marshmallow and Bubble Berry. The packaging is made with plant-based plastic and a bamboo cap is colourful and much less boring looking than a tube of your regular Colgate. For £7.99 buy a gift to protect the planet and your kids’ teeth from all those festive sugary treats. For the child who loves stationary. I would choose these AMAZING stocking fillers from Smiggle! Smiggle is one of the most colourful fun, fashion-forward stationery stores that my son just loves just browsing in! If you want bright, affordable stocking fillers then choose from their many bright pens, notebooks and gadgets. Encourage your children to explore, poke, prod and play! Take a whiff of this scented robot, get creative with the DIY Motorbike kit and impress friends with the Stylin’ analogue watch with PU printed strap and flashing coloured lights. P.s make use of the 20% discount when you sign up! We dare you to fail to find something that you love! For the child who loves spending time in the kitchen. I would choose these tasty Chocolate Sprinkle Stix. Rather than buying children boxes and boxes of snacks (which they all ask for) why not get them a gift where they can make their own yummy bite size treats. All you need to buy is the ingredients, breadsticks, chocolate etc which means this present works for children with allergies too, as you are in control of the foods. The kit is easy to clean and dishwasher safe. You can use it over and over so the price tag of £21.99 is really reasonable. The contents are easy to put together and the process so simple. I like that Sprinkle Stix offers a safe way for children to melt chocolate. Endless tasty fun! They might even share with mummy! Available to buy HERE! 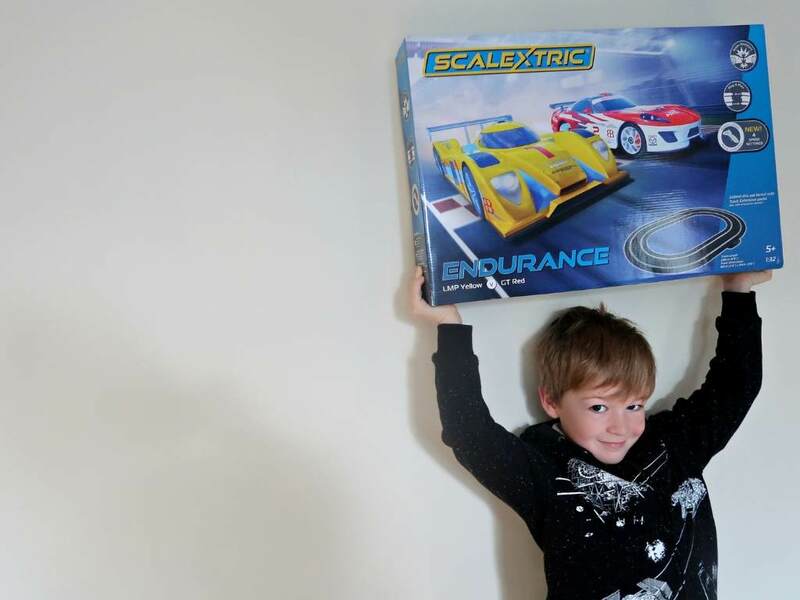 For the child who likes everything car, I would choose the all-time favourite Scalextric! Check out the Endurance Set, a standard kit with two cars, controllers and a flat, circular track which is suitable for age 5+. The track only takes minutes to set up with its simple slot in construction and was laid by my seven-year-old! There is a lot of flexibility in the plastic. In my youth we had a track that lived in a suitcase in the loft. At the far ends of the circuit as they were far away from the power unit the cars slowed down for the bends through sheer loss of voltage. Let’s say simply that things have changed. You still have the immense red and yellow car battle, but this kit boasts new super resistant cars (after a week of being slammed off the track they are showing no sign of breaking!) and speed limiter hand controllers. It is fast, fun and a fantastic buy that will get years of use for £64.99. Want a bit extra? The why not buy an expansion pack for extra curves and challenges for the pro driver?! For the child that just wants you, I choose an experience day from BuyAGift. Bored with the normal toys and standard gifts? The problem is finding something kids will really engage with and find interesting. Sometimes all kids want is time and laughter with mum and dad. With their brother and sister or friends. Yes, they may want the newest Nerf gun but presents don’t always mean time to play. Buy something they will never forget, choose from animal encounters, young driver experiences or this tasty ‘Children’s Chocolate Workshop for Two at Hotel Chocolate’ for £40. A dream come true for any child with a sweet tooth they will discover the enticing world of cocoa! Buy a little box with an amazing experience inside HERE. For the child trying to see Santa on Christmas Eve. I would choose Spearmark Illumi-mates to light up child’s Christmas. From Paw Patrol to Star Wars to PJ Masks these lovable characters glow gently at night for children that don’t want the brightness of a nightlight but still need some comfort. I like the fact there are designs to suit older boys i.e. Groot and ones perfect for littler girls such as this lovely My Little Pony light. I LOVE that they stay cool so are safe to be handled by small, grabby fingers and will sit happily on a bedroom shelf. For £7.99 the Illumi-mates are the perfect stocking filler. For the child that wants a doll with a difference, I would choose this Darcy Curl companion. Darcy Curl is 18 inches tall and hand crafted with a high-grade plastic vinyl and half soft cloth body, so she is huggable but also sturdy! Unlike Barbie she has body and facial dimensions of an average 7-year-old girl. She comes with a limited edition carry case, so you can take her with you on your adventures and store her safely. She is beautifully made with high quality, soft curly hair and comes with luxury school uniform outfit. We love that a child doll looks like a child. Retailing HERE for £72 it is a perfect buy. What about for babies? Check out these fantastic presents for the littlest family members. With under ones, gifts are then usually for the parents benefit as well as the babies as they can’t ask for something and happily just enjoy the wrapping paper. We tend to go with presents that will have use, or that have been recommended by other parents. For the baby that likes to dress up, I would choose this adorable (I mean scary) Baby T Rex outfit by the Natural History museum. With its soft, plush all-in-one hood you can buy this design for little ones from 6 month up to three years. My daughter was happily commando crawling round the floor, so it must be comfortable, and it was so cute to see her little tail moving. For £19.95 you can get your dino on HERE. Pretend To Bee sell a huge variety of role play and character costumes so there will be something perfect for children of any age, you can even buy outfits for dolls to match the child’s! Also, if you need nativity outfits for the festive season, then look no further! For the baby that likes to chew, I would choose this 100% non-toxic silicone Nibbling teething necklace. Safe, practical and stylish this necklace provides a lot of relief to my teething daughter and a focus for when she gets distressed. The bright colours and fun design of this Havana necklace is perfect for tactile and sensory awareness and I like the group of 4 hexagon beads at the base as my daughter can grab at it better with her hands. Note: Don’t cut the length. You may think it hangs a little long, but this is a perfect grabbing length for little hands! I love that all the necklaces have a breakaway clasp for added safety and comfort for mum if baby is really giving it a tug! Of course, as it has strings, I wouldn’t advise just handing it to baby just to play with but around mums neck it is the perfect chewable accessory. It will get very dribbled on so parents will be happy to know that it is dishwasher safe, can also be hand washed or steam sterilised. At £18 it’s the only jewellery you can wear well with a baby! For the baby that just wont sleep, I would choose the Sleepyhead® Deluxe+. Suitable from birth – 8 months The Sleepyhead® Deluxe+ is one of our must have multifunctional baby buys. At two weeks we bought one in desperation for no-nap’ Norah. Hand made in Europe from Oeko-Tex certified materials it is lightweight and portable, they are perfect to use round the house for day sleeping and make the ideal travel companion. Just pop it in the carrier and sling it in the back of the car when visiting nanny! No need for a Moses, travel cot, baby gym or even change mat. The cushioned space recreates the womb. Why not try it as a companion to night feeding? Ours also fit perfectly in the Snuzpod co-sleeper. Setting the quality standard for baby pods we fell in love with the enviably stylish yet functional designs with a range of covers to match any nursery. Bananas for you is our favourite. Available from £130.00 HERE the Sleepyhead® Deluxe is a tested and certified product used in both Bristol and Alderhay Children’s Hospital to calm and settle babies. ALWAYS read safe sleep guidelines and pick what is best for baby. For us we have just bought the Grand for nigh time cot transition/reduction and again were not disappointed (9 months –3 years +). For the baby that needs help settling at night, I would choose Johnsons sleep tight gift set. At £12 this lovely bundle of products encourages bonding time and using Johnsons 3 step routine of bath, massage and quiet time really helps relax your little one. Bedtime products include baby oil, baby lotion, baby bath and baby wash where little goes a long way. I love that this set includes baby friendly extras; a beautiful soft little pair of socks and book that your baby can read/chew on in the bath! The lovely aroma will fill up your bathroom and all ingredients are gentle and sensitive skin friendly. For the baby that loves their food, I would choose the TUM TUM Boris Bear Baby Weaning set. Perfect for dipping, dunking, munching & lunching these beautifully gender-neutral designed products are the perfect accompaniment to weaning. Make lunchtime fun with foodie faces, the perfect snack sized pot and double ended spoon for main and putting. It is the ideal first children’s dinner set being sturdy with a non-slip base. The bear pictures reveal themselves once food has been eaten and they are dishwasher safe for easy cleaning. My favourite item has to be the super cute 200ml sippy cup with weighted straw for any way up drinking. The handles help baby develop coordination and lid means no spillages in your travel bag. For the baby that just wants to play, I would choose the Infantino Grow With Me Teepee. What is Santa planning on getting your children this year? Coal? Are you an over spender or are you a one or two present household? I will be spending Christmas with my Husband, 2 children, my mum and her partner, my sister her partner and her daughter. I try not to overspend but normally do go over a little bit.